From its humble beginnings as an indie comic book, The Walking Dead has become a pop culture juggernaut boasting New York Times-bestselling trade paperbacks, a hit television series, and enough fans to successfully take on any zombie uprising. Triumph of The Walking Dead explores the intriguing characters, stunning plot twists, and spectacular violence that make Robert Kirkman's epic the most famous work of the Zombie Renaissance. 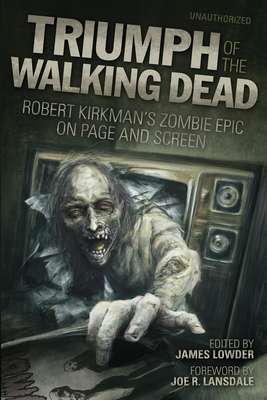 The Walking Dead novels' co-author Jay Bonansinga provides the inside story on translating the comics into prose; New York Times bestseller Jonathan Maberry takes on the notion of leadership (especially Rick Grimes') during the zombie apocalypse; Harvard professor Steven Schlozman dissects the disturbing role of science in the television series; and more. "Fun and informative . . . Triumph of The Walking Dead successfully manages to do what any collection of its sort intends: Help us understand why the series is so good (and successful), while enhancing our enjoyment at the same time."